Sonja Shin has more than 20 years of experience designing, building and producing websites. She has designed and built websites for NASA, Stanford University and many small businesses and non-profits with everything from Dreamweaver to Wordpress and Squarespace. She has also produced website assets for a variety of companies, including walmart.com. Please see samples of her work below. Completely redesigned and built the Research Compliance Office website and three department sites: Human Subjects, Stem Cell Research Oversight and Laboratory Animal Care (including hundreds of webpages, using Dreamweaver). Created visual branding and new graphics. Refined messaging by editing and writing new site text. As a Public Affairs and Development Specialist at NASA Ames Research Center, designed, built and maintained the several-hundred page NASA Research Park website (using Dreamweaver, site designs were used from 2000 to 2005 – style was modified when NASA moved to a uniform look for all NASA sites). Wrote and edited all site text. Completely redesigned and built several-hundred page website for the Stratospheric Observatory for Infrared Astronomy (SOFIA) at NASA Ames Research Center in Silicon Valley (using Dreamweaver). Created new branding and created new graphics. Designed and created The New Game website (with Squarespace). Created visual branding and messaging (wrote all text). Interviewed founder and shot videos about the company. Set up social media on Facebook. "The site is perfect! I love it!" Designed and created ABC Plumbing & Drain website (with Squarespace). Created visual branding (with existing logo) and messaging (wrote new copy and refined existing text). Redesigned the Soul-Esteem Center website (with WordPress). Created online store for selling digital media. Helped devise marketing and business development strategies. Redesigned, built and maintained the Uptown Drug & Gift Shop website in Los Angeles (using Dreamweaver, design was used from 2010 to about 2013). 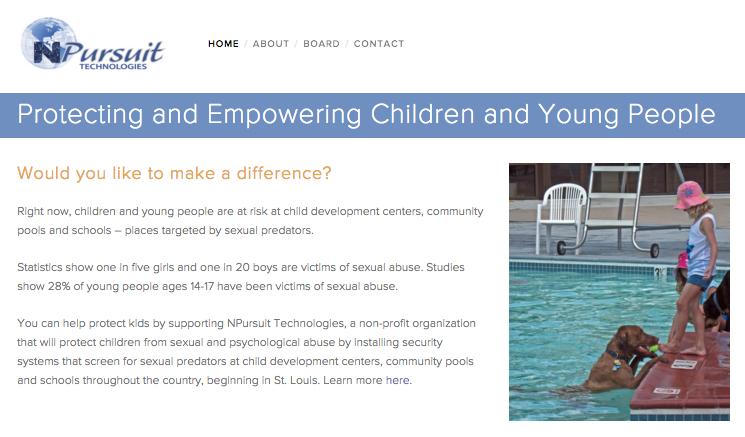 Designed and created NPursuit Technologies website (with Squarespace). Wrote new copy and edited existing text. Created PowerPoint video for potential sponsors. Completely redesigned, built and maintained the Stamp On Over website in Sunnyvale, CA (using Dreamweaver, design was used from 2005 to about 2010). Created branding (with existing logo) and new graphics. "Sonja's creative website design, fresh and trendy ideas, website photos, exciting marketing techniques and hip business ads are assets to my business. She is wonderful to work with and always gets the job done better than my expectations. I am so pleased to have found her!" Write and edit all text. Designed, helped write, copy edited marketing materials for Los Angeles-based health coach Christine Gonzalez. Redesigned client handouts and created company backgrounders. “It was truly a pleasure to work with Sonja in developing solid marketing materials to support my health coaching practice. Sonja took the lead with project management and came up with countless creative solutions to help me effectively represent and expand my business. Her knowledge base in medical journalism and web design were huge assets. Sonja's reliable and efficient work ethic allowed me to delegate tasks to her without worry. Her professional, focused, and balanced demeanor kept me on track as well.